We need your help. 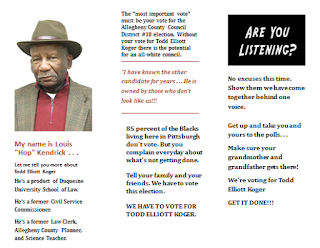 As part of the "kogerfriend" program (when supporters and volunteers personally contact people they know and ask them to vote for Mr. Koger) instruction for folding a "three-fold brochure" and the exterior and interior images for print are now provided. 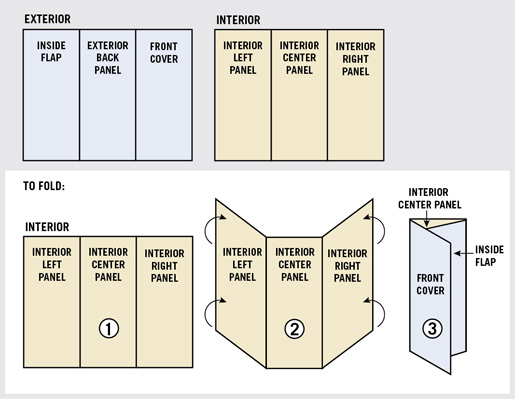 Just print the document, fold it, and visit people you know in your neighborhood. 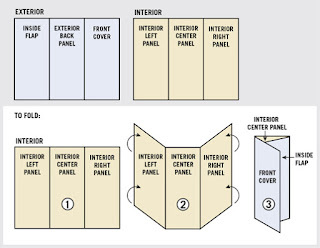 Also use copies of this document as a "Polling Station Captain" responsible for organizing voter contact on Election Day at your particular polling station. If you live and vote in Allegheny County you can help!!! Get Out and Vote! Tuesday, November 3, 2015. Call B-PEP's "ROLL TO THE POLLS" at the *CISP Office in your area before Election Day. To arrange a ride on Election Day-November 3rd, Call-412-434-0919. Two great men and Pittsburgh civil rights champions (the current and former Allegheny County District #10 Councilmen, William Russell Robinson and Louis "Hop" Kendrick) passed their legacy of long and tireless BLACK INDEPENDENT LEADERSHIP to Todd Elliott Koger today. 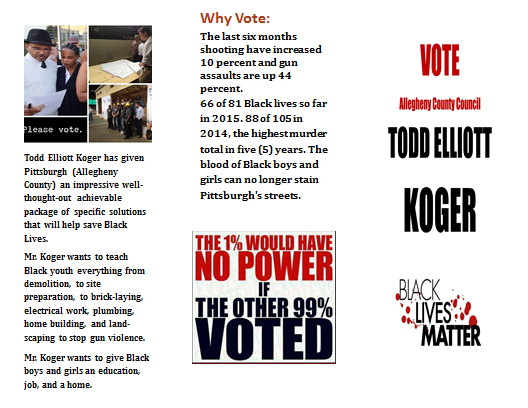 Todd Elliott Koger wants to rebuild Pittsburgh's BLACK NEIGHBORHOODS "from the ground up!" He wants a broad city-wide subsidized jobs program that will guarantee a minimum income for BLACK FAMILIES and give BLACK BOYS and GIRLS an education, job, and house to live in and stop GUN VIOLENCE!!!" Mr. Koger wants a Redevelopment Assistance Capital Program and a Regional Destination Financing Plan. A proposal to teach BLACK YOUTH everything from demolition, to site preparation, brick laying, electrical work, plumbing, home building, and landscaping to stop GUN VIOLENCE. Whatever you may think of Todd Elliott Koger . . . He has given Pittsburgh an impressive well-thought-out achievable package of specific solutions that will save BLACK LIVES. Arguably "on the merits of his proposals" his suggestions surpasses anything the current BLACK LEADERSHIP, NAACP, Urban League, B-PEP, Mayor Peduto, and/or County Executive Fitzgerald have advanced. Todd Elliott Koger needs your help. Send a dollar, five dollars, "Campaign for Todd Elliott Koger" Citizens Bank, 5550 Centre Avenue, Pittsburgh, Pa 15232.